Let’s look at the basic concepts of “jing”, “qi”, & “shen”. These are collectively known as the “Three Treasures” (sānbǎo, 三宝) of internal alchemy. They are often translated as “body”, “breath”, & “mind”, which is a good trio but not really a complete translation. It’s helpful to understand these terms, and the view behind them, to effectively practice Daoist cultivation. Jing (精) is vital-essence – the tendency for form & substance to appear in the world, our tendency to become embodied creatures. We receive jing from our parents at conception and from our mother during gestation. Jing is associated with fluids and contains our ancestral DNA; the Chinese consider it to hold our fate or destiny – “Heaven’s command” regarding our unique capacities and pre-dispositions. The quality of our jing depends on the quality of our parents’ jing during conception and gestation, as well as our own conduct in life, particularly our movement and nutrition. Qi (氣, pronounced “chee”) is vital-energy – movement, breath, time, change. The ever-revolving walk of Dao. The unfolding movement of our jing. Qi is associated with wind and fire. But it is also often used as a shorthand for everything, including jing & shen. Qi can refer to different kinds of energy in different contexts. In internal alchemy it generally refers to heat and movement. We have internal qi, and there is also the qi of the environment and cosmos. Shen (神) is vital-spirit – awareness. The experience of jing-qi. According to Daoism, we have 5 kinds of shen, associated with the 5 phases/elements (Wood, Fire, Soil, Metal, & Water). The 5 shen are different aspects of consciousness. In the Daoist view, shen is not entitative in nature but is more like drops from a boundless ocean. Our original shen emerges fresh and pure from the unborn origin, but as it splits into 5 it takes on conditions based on our jing & qi, as well as how we manage our mind. Jing, qi, & shen are all really the same “stuff” – just different parts of a tripartite spectrum. Jing is the most coarse, shen is the most fine. These correspond to Earth, Humankind, & Heaven, respectively. Jing, qi, & shen exist in two states, known as xiantian & houtian. Xiantian (先天) translates as “before Heaven” or “pre-celestial” and refers to our innate nature before being shaped by the winds of Heaven. Houtian (後天) translates as “after Heaven” or “post-celestial” and refers to our acquired condition based on how the winds have shaped us and how we have conducted ourselves. The Three Treasures collectively comprise our life. The three traditional deities of ritual Daoism – San Qing (三清) or Three Purities – are simply symbolic representations of the Three Treasures in their pure, unmanifest form. What appears to be deity worship in Daoist ritual is actually a way of re-calibrating our post-celestial jing, qi, & shen to their original, pure condition. There is a lot more we can say about these terms; this post is simply intended to present basic definitions for reference in future discussions. The fundamental triad of Chinese philosophy is Heaven, Earth, & Humankind. Let’s look at what these terms mean as a whole and individually, and how they relate to meditation & qi-cultivation. Heaven (tiān, 天) in the manifest world is the wide-open sky, but in Chinese philosophy it refers to pure yang – the creative source. Pure motivating light. It’s not some special place where believers go but rather is the original impetus of all manifestation. It relates to spirit/awareness. Earth (dì, 地) in the manifest world is the solid ground beneath our feet, but in Chinese philosophy it refers to pure yin – a wide-open field. Earth receives the motivating activity of Heaven, enabling it to manifest. While it relates to material like the planetary earth or our body, the meaning is more like the mother that receives a seed from father and nurtures it to life. Humankind (rén, 人) – or what I prefer to translate more broadly as “sentient beings” – is the fruit of the union of Heaven & Earth. While in the manifest world Heaven is above and Earth is below, the understanding in Chinese philosophy is that first Heaven initiates, then Earth nurtures, then life emerges forth. Collectively, Tian-Di-Ren represent the vertical structure of the cosmos. But structure isn’t really the correct word, because the Chinese view of the cosmos is not material but energetic. A more appropriate word would be process – the vertical process of how things come into being. Heaven acts in the field of Earth, then Earth processes it and gives birth to some resultant thing. All life springs up from the Earth below, it doesn’t just fall from Heaven. Even birds nest on the Earth. But just as mother must be fertilized by father, the Chinese understand this springing up of life as an upward bounce from the descending qi of Heaven. (Hence the lines of the Zhou Yi Jing start at the bottom and then rise upward). In Laozi’s meditation & qi-cultivation, we model our practice on Dao. As Laozi says, “the motion of Dao is return”. So a primary aspect of Daoist cultivation is returning human beings to pure yang. Shifting from the generative to the returning direction is called neidan or internal alchemy. To embody the returning motion of Dao, we first align ourselves with the vertical axis of Heaven & Earth – in sitting, standing, and/or moving forms. Then we become empty like Earth and let the qi drop all the way down. “Empty the heart-mind and fill the belly.” With regular practice over a period of time, qi will eventually stir in the lower dantian and start to rise on its own. This is the reverse bounce. According to neidan, a true human is one who not only lives as a result of Heaven acting upon Earth, but who can reverse the generative process of Heaven & Earth – drop the qi all the way down and bounce back to Heaven. Let’s look at the term Dao-De. This is of course the title of Laozi’s Dao De Jing, the pithy seed-text that inspired one of the most complex & elaborate – and insightful – religious traditions in world history. Dao-De translates directly as “way-virtue”. It is commonly translated as “the Way and its Virtue” – but that translation is a bit lofty and remote. What does it mean? Let’s look at each character and come up with a fresh translation. The character Dao (道) consists of 3 parts: grass + itself + walking. Grass growing by itself. This image serves as a metaphor for the spontaneous emergence of worlds & creatures from the primordial origin – the eternal procession of birth, growth, maturation, decline, & death. The Great Thoroughfare. Dao is not some remote cosmic power but the very process of our own experience unfolding moment-by-moment, of itself. The character De (德) also consists of 3 parts: upright + heart + stepping. Stepping with an upright heart. Upright suggests verticality, which in Chinese means alignment with Heaven. Stepping on Earth in alignment with Heaven means conducting ourselves moment-to-moment in accordance with the unfolding Dao, with acceptance, humility, and benevolence. Dao-De then is staying with the natural movement of Dao, letting ourselves dissolve into the Great Thoroughfare. Keeping our heart aligned with Heaven amidst the changes of Earth. This means not straying into the past or future, not wanting things to be other than as they are, simply staying with reality. Not resisting reality is what Laozi calls “wuwei”. In the context of meditation & qi-cultivation, this view of Dao-De means our practice methods are not geared toward reaching any particular destination but rather are ways to walk on the very ground beneath our feet. There has been a lot of rumination and debate in the West about whether Daoism is a philosophy or a religion. This started when early Western observers (primarily Jesuit missionaries) perceived a disconnect between the “philosophy” they read about in Laozi, Zhuangzi, and other early Daoist texts, and the actual “religious” practices they observed in Daoist ritual. A perspective grew in the West during the 20th-century that there were in fact two Daoisms – the original pure philosophy, and the latter-day religion. Chinese Daoists don’t tend to recognize any such bifurcation, and 21st-century scholars have largely debunked the notion of two separate Daoisms as they have continued their research and discussions with actual practitioners. Indeed, early Daoist texts do not recommend the kind of complex & elaborate ritual practices that came later. As we know, Laozi & Zhuangzi emphasize simplicity and naturalness. We also know that much of the religiosity of later Daoism appeared as a nativist response to the introduction of Buddhism from India. So there may be a case for distinguishing the original Daoism from later traditions. But many of the practices of Daoist ritual actually pre-date Laozi, dating back to pre-Daoist shamanism. Many “Daoist” practices are not necessarily Daoist but were forms of shamanism that Daoism embraced. More importantly, however, is the dynamic and harmonious interplay of these practices with the various aspects of Daoist “philosophy”. Let’s look at the meaning of the words philosophy & religion. Philosophy comes from the Greek philosophia, meaning “lover of knowledge” – it implies using rational analysis to satisfy an appetite for understanding. Religion comes from the Greek religare, meaning “binding” – it implies offering sacrifice and relying on a deity for some kind of deliverance. So we can say philosophers are rational thinkers in search of insight into the nature of reality, whereas religious adherents faithfully bind themselves to a higher power. Daoism is neither of these. Based on the above definitions, we could say philosophy concentrates qi in the head, and religion concentrates qi in the heart. Daoism at its basis relaxes qi from the head and heart, letting it gather in the belly and likewise letting it circulate all over. Indeed, there are many philosophical concepts underlying Daoism that are important to understand, such as the cosmogeny of wuji, taiji, yin-yang, and the five phases of qi – not to mention how wuwei relates to these concepts. And there are numerous ritual practices, precepts, and even deities – but in Daoism these are all simply ways of cultivating qi and expressing Dao-De. Daoism is a system – or rather a broad family of varied systems – of qi-cultivation with a philosophical basis in ancient Chinese thought and various methods of hygiene, meditation, & ritual. Is this philosophy or religion? The mountain shadow moves with the sun. One of Zen Master Seung Sahn’s foundational teachings was the Zen Circle. It highlights different experiences and approaches to cultivation and serves as a compass for our practice. He broke the circle into 0°, 90°, 180°, 270°, and 360°. 0° represents our “before practicing” condition. In Buddhism this perspective is characterized by discomfort (dukkha) & delusion (samsara). In Daoism it is characterized by vulnerability to qi-disorder. This condition is our everyday “monkey-mind”, associated with animal consciousness and basic survival. 90° represents striving to improve ourselves, to gain understanding, or to find relief from suffering. This includes self-improvement paths such as fitness & martial arts striving to achieve excellence; therapeutic paths working to release our issues; and philosophical paths ruminating to understand reality. In Daoism these approaches are referred to as laying the foundation – they can be an important step in rectifying discomfort & delusion to prepare us for internal cultivation. This perspective separates human beings from other animals, but it offers limited fruition if we don’t progress to other parts of the circle. 180° represents emptiness, samadhi – a direct encounter with our original nature. In Daoism this is referred to as infinity (wuji), pre-heaven (xiantian), or original spirit (yuanshen). The experience of wuji transcends paths of fitness, therapy, & rumination – these paths may or may not lead to 180°. Laozi refers to 180° as “returning radiance” – turning the light of awareness around to shine upon itself. Gazing into the source. This is the direction of alchemy practice. Daoist alchemy isn’t just gazing with the mind but turning all of our qi around to flow back into the unborn origin. There are physiological changes. But this fruition too is incomplete – it’s a phase, similar to sleep or death. Dao continues to generate myriad worlds & creatures, so if we are to abide in complete reality we need to not fixate on samadhi. 270° represents the realm of magic and miracles. Playing with pre-celestial qi. This is the realm of Daoist ritual practice, tantric Buddhism, and some kinds of yoga. It differs from 90° because we are channeling pre-celestial qi, so it is much more subtle. Magical practices usually focus on refining qi, improving conditions for ourselves or others, or actively treating karmic conditions to bring them to resolution. While such “getting what you want” practices may improve conditions, they ultimately don’t offer any lasting end to discomfort and struggle. 360° represents complete reality – things-as-they-are. Laozi, like Zen, starts and ends here. From this perspective, there is really no need to struggle for survival, to strive for fitness, release, or understanding, to focus inward, or to play with magic. Letting ourselves be just as we are, without distortion, without spiritual ornamentation, and without effort is wuweidao. This means responding to things as they arise. Importantly, 360° is located in the same position as 0°. This is the nature of “sudden” paths – we don’t have to gradually progress along any path in order to arrive, as the destination is always at hand if we only open our eyes. All of the other points on the circle take time to ripen. People often misunderstand Laozi as being a philosopher, alchemist, or sorcerer, but none of these are entirely correct. “The great Dao is wide-open, but people like narrow-paths” (DDJ 53). Narrow-paths are 90°, 180°, and 270°. Once we have a wide-open 360°-view, we see these paths in a larger context. We can see their benefits and limitations. We can engage in them without becoming entrenched in them – our motives are different because our view is different. Laozi’s adepts may or may not practice the myriad methods – none are required or prohibited. Our tradition emphasizes the importance of View-Method-Fruition. This trinary mechanism functions as a circle of “Great Completion” (大圓). View is our perspective – how we see ourselves and how we see reality. The character guàn (觀) shows a heron watching something, meaning to keenly perceive – this character also means Daoist temple. Our view informs how we relate to the world, how we approach our formal practice methods, and what we expect to “get” out of our practice. Method refers to our various formal practices of hygiene, meditation, & ritual, as well as our informal conduct. The character yòng (用) shows a water bucket, indicating a useful device. Methods are means to achieving a desired end result – like using a bucket to water a tree. Fruition refers to the ripening experience resulting from practicing methods with a view. The character guǒ (果) shows a tree bearing fruit – the successful achievement of the goal, the whole purpose of the bucket. View-Method-Fruition correspond to Heaven, Earth, & Humankind – Heaven being the primary inspiration, Earth being the field of activity, and Humankind being the resulting fruit of the union of Heaven & Earth. From this perspective, we can see the importance of looking into our view – what am I? What is reality? If method is a bucket, view is the water – we can put something else into the bucket but when we pour it onto the tree it’s not going to have the same effect. Our practice needs to align view & method in order to ripen the fruit. In the broad suite of spiritual or energetic practices out there, each is inspired by a particular view. In the West today we have many opportunities to learn practice methods, but their transmission doesn’t always include the underlying view – the view is actually often stripped out in order to make the method more palatable to our existing views. For example, we can learn yoga, meditation, or taiji by people who tell us we are free to apply our own beliefs to them. This is the American way – show me what you’ve got, but don’t tell me how to think. Wonderful. But practicing Daoist methods without the corresponding view does not lead to the intended fruition. This is particularly important when approaching the non-conceptual contemplative meditation & qi-cultivation of Laozi. The method is simple but the view is paramount. If we are pushing for results, Laozi’s method is futile. If we are looking to get saved or to become a superhuman being, his method is worthless. So in our school we study Laozi’s text as a “view” manual for meditation & qi-cultivation. Laozi may not include many technical points, but his view-teaching deeply informs the proper method of contemplative meditation & qi-cultivation. Not all Daoist texts and practice methods are aligned with Laozi. Alchemical Daoism has a great deal of complex concepts that are important to understand in order to practice its methods effectively. And the methods tend to be quite complex and elaborate. Laozi’s contemplative Daoism by comparison doesn’t rely on many concepts so much as an atmospheric qi-quality shared between mentor & disciple in the context of Laozi’s teaching. The corresponding method is simply abiding in that atmosphere. My Daoist teacher was a view-teacher; he didn’t spend much time on method instruction. Just enough for it to carry water to the roots. If you’re studying a Daoist art, I encourage you to tap your teacher to ask about the underlying view of the practice. In our tradition, when our practice starts to ripen, the view becomes ever more clear and the method becomes ever more effective. This is the circle of Great Completion. Wuwei is probably the most inspired concept in all of human history. Laozi coined this term in the Dao De Jing, and it is indeed the central theme of the text. Laozi did not develop the basic cosmogony of Daoism – the waxing & waning of yin & yang was already well understood long before, and numerous other Daoist theories & practices are not necessarily inspired by Laozi. What Laozi presented was wuwei – how the Dao functions in the world and how the sage conducts himself. Although this term is important in all Daoist traditions, different traditions have different interpretations of what it means. Let’s look at the old characters* from the perspective of our tradition. The old character for wu (無) shows a person (人) holding wood (木) in either hand. Perhaps because of the homophones for shaman (巫) and dancer (舞), it is typically understood as a dancing shaman holding ritual sticks. I also see a person in the forest – a homeless hermit with nothing to his/her name, or a person holding “the uncarved block” – grasping unmanifest simplicity. 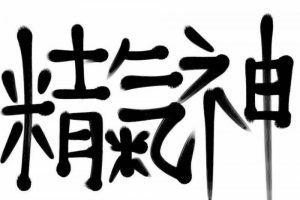 I also notice the entire character conveys the image of fire (火), and the modern traditional character places the radical for fire (灬) at the bottom, so the image of burning wood (i.e. transformation) may be important to understanding the meaning of wu. Taking the gestalt of these images, I see a homeless shaman-sage conducting a ritual dance in order to transform or banish something. The image is of ritual practice transforming something from one state to another. This ritual represents what Hindus call the dance of Shiva. What Brahma creates, Shiva destroys. Shiva is not a devil; Shiva is that aspect of Dao that moves things along – transformation through destruction. So wu means emptying things out, purging and moving them along, sending spirit up and leaving only ashes below. It can also mean having nothing – no home or belongings, no agendas or delusions. Wu is commonly used to denote nothingness or the lack of something. The old character for wei (為) shows a claw above an elephant. Whereas hand (手) represents skillful activity, claw (爪) implies exertion of force. In ancient China, elephant (象) symbolized strength and intelligence. So wei means cleverly wielding strength – deliberate, intentional activity undertaken in order to achieve some result. Leading the elephant where you want it to go. The character for elephant also means form or appearance, so another meaning could be to claw at appearances, which also implies exerting force to get something. Most of Daoism throughout history has indeed consisted of undertaking intentional methods in order to achieve specific results. Interestingly, when the character for person is added to the left, it generates another character wei (偽) that means false pretense, artificial, or contrived. I think wei also suggests the magical “getting what you want” practices that exist within Daoism. What does it mean when we put these two words together? The Dao De Jing has no punctuation marks and the language is very terse, so terms like wuwei can be read separately as wu & wei or together as a single concept. Some schools interpret wuwei as using emptiness (wu) in order to achieve certain results (wei); others interpret it as using intention (wei) in order to push things along to another state (wu). In our tradition, we view wuwei as a single concept that describes the way nature functions. Wu is our state before birth. Before our mother & father were born, what were we? Long after our children pass away, what are we? In our practice, we become intimate with the nothingness that precedes, underlies, and outlasts our lives. Our tradition notes that no matter how much effort (wei) we apply in shaping the world to meet our desires, wu always comes along and transforms our creations back into nothingness. Even if we make some huge mark on the world, eventually that mark passes away. Wuwei invites us to try something different. What would it be like to apply wu to our wei? Extinguish all effort. Abandon strength and cleverness. This shift opens up the possibility of relating to the world (and to our practice of meditation & qi-cultivation) in a different way. Relating without struggle & strain. Wei is based on wanting things to be other than they are. Wuwei is accepting things as they are, adjusting to the continuous transformations of nature. Laozi’s practice is not about getting what we want but relaxing into the way things are. Wuwei is how we come into the world and how we grow and change and return. Wuwei is how water flows downstream, how clouds form and break apart, how trees grow and blow in the wind. Nature functions through wuwei – the birth, growth, maturation, decline, & death of myriad worlds & creatures is not driven by intention and effort. It just happens. Like good art. The ritual image of wu suggests personal engagement in this natural process. Laozi said: “wuwei but not buwei” – wuwei is not “doing nothing” as a direct translation might suggest. Daoism includes various active practices of hygiene, meditation, & ritual. But Laozi’s tradition does not focus on practicing particular methods so much as on how we practice whatever we are practicing. Wuwei invokes a qualitative shift away from struggle & strain, finding natural ease in our conduct moment-to-moment. Retract the claws and dance with Shiva.